By far, my absolute favorite interior feature of Bustachio is the look of the vertically paneled pallet wall in the kitchen area. Marty, who I’ve been known to call a hoarder behind his back, would travel through local construction areas and collect the abandoned pallets stacked in the debris piles. I even helped in this endeavor a time or two, guiding the pallets onto our trailer and then acting casually when a car would drive by so as not to appear to be stealing. The pallets made their way to our home, stacked behind our garage out of my sightline and out of my mind. Marty said, “I’m going to use these for something someday.” I responded with an eye roll. And a deep sigh. And most likely another eye roll. Long story short (‘cuz I can’t get through a too long blog post either), I’ve had to eat my words and steady my eyes. After planing and staining, these pallet boards are amazingly fantastic! 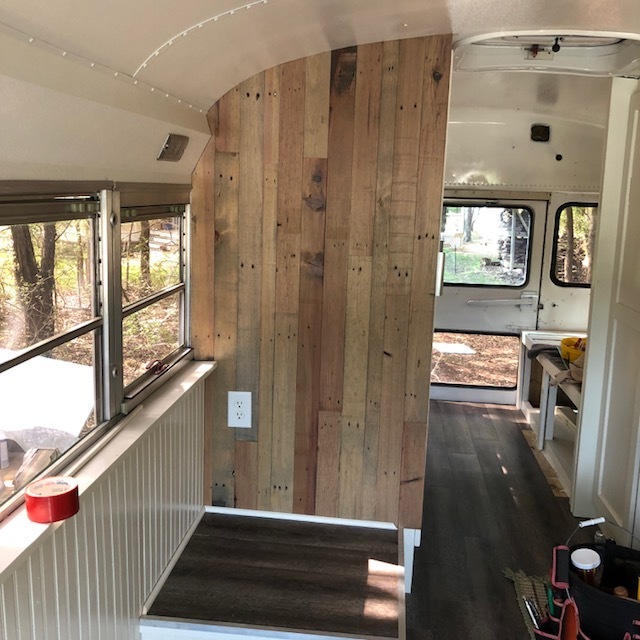 Sure Chip and Joanna made shiplap siding popular again, but these TLC’d pallet boards, with their organic “from the earth” warmth and character, are just the thing our big sturdy metal bus needed.